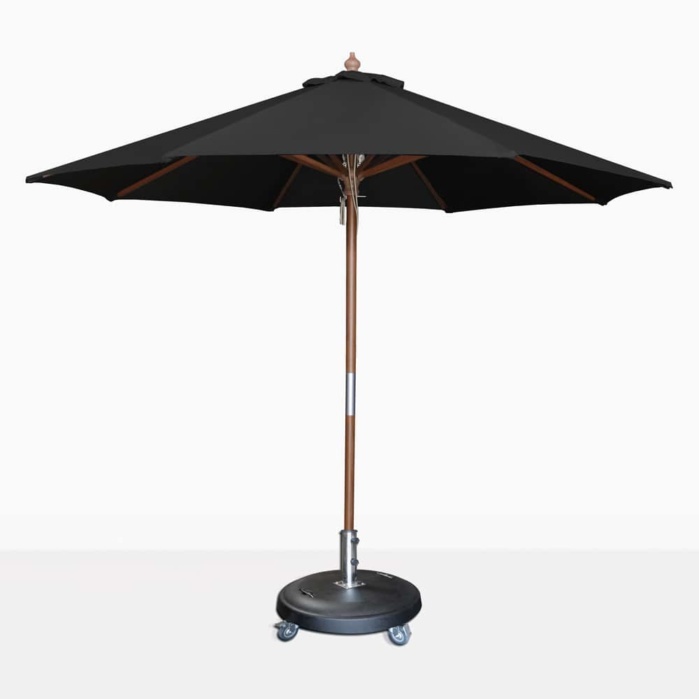 The Black round Dixon umbrella is a classic good looking patio umbrella that will provide shade on sunny days. This attractive patio umbrella provides ample shade on hot, sunny days. This size is just right for entertaining four to six people around a dining table, but flexible enough to use with outdoor lounge chairs. The pulley system is easy to use. The canopy is made of non-fading Black Sunbrella® fabric. The umbrella base shown is not included in the price. Teak Warehouse has stands for these umbrellas at various styles and prices. Please call and discuss with one of our professional sales team members. The Dixon is also available in colors of Canvas, Taupe, and Black Sunbrella® canopies. Other sizes available are 9.0, 10.0 and 11.5.